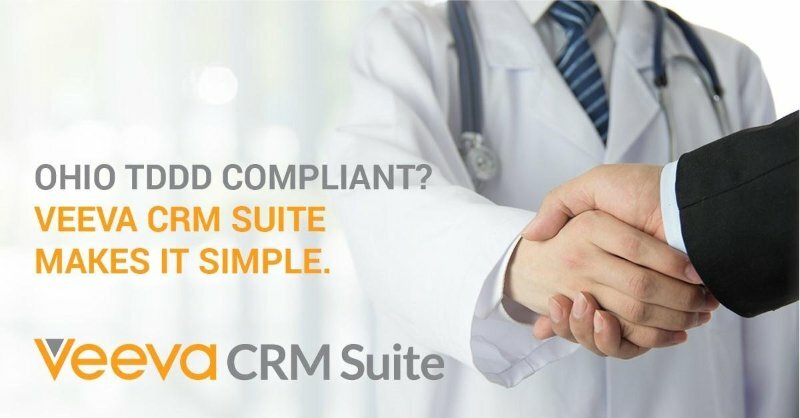 Learn how Veeva CRM Suite eases Ohio TDDD compliance. Call 1-866-417-3024. Regulations, such as the Ohio Terminal Distribution of Dangerous Drugs (TDDD) law, require life sciences companies to ensure on-going compliance. Veeva CRM Suite brings together data and validation, enabling field reps to confidently promote their products while remaining in compliance. Sampling validation logic in Veeva CRM, combined with Ohio TDDD license data from Veeva OpenData, allows field reps to easily confirm that targeted customer organizations are properly licensed at the point of distribution. Sampling and physician education can continue without interruption or fear of regulatory repercussions. Veeva develops compliant and integrated solutions so you can focus on what matters most: bringing critical treatment options to prescribers and their patients. Reduce your compliance burden: Built-in compliance allows field teams to detail prescribers and sample products, without delays or complex workarounds. Adapt fast to new regulations: Veeva CRM Suite adapts rapidly to help you stay current with changing regulations as they take effect. Stay focused on your business: Up-to-date licensure information, affiliations data, and automated validation checks work together to keep your reps focused on commercial execution.